An early morning walk around Copenhagen this morning reminded me of a longer visit I made here about 25 years ago, during which I rented a room in a nice large apartment on Frederiksberg Allé, which is in a rather posh part of the city called Frederiskberg. The landlord, who also lived on the premises, was a Mr Vagn Jul Pedersen, a nice old man who had lived in that part of the city all his life. One evening we sat talking over a beer or two and he told me of a terrible thing that he had seen during the latter stages of the Second World War when he was a young man, and I thought some of you might be interested to learn about it. In March 1945, the British decided to carry out a low-level bombing attack on a target in Copenhagen, which was under German occupation at the time. The mission was given the codename Operation Carthage and its primary objective was the Shellhus (“Shell House”) originally owned by the oil company, but commandeered by the Nazis for wartime use as the Gestapo headquarters. 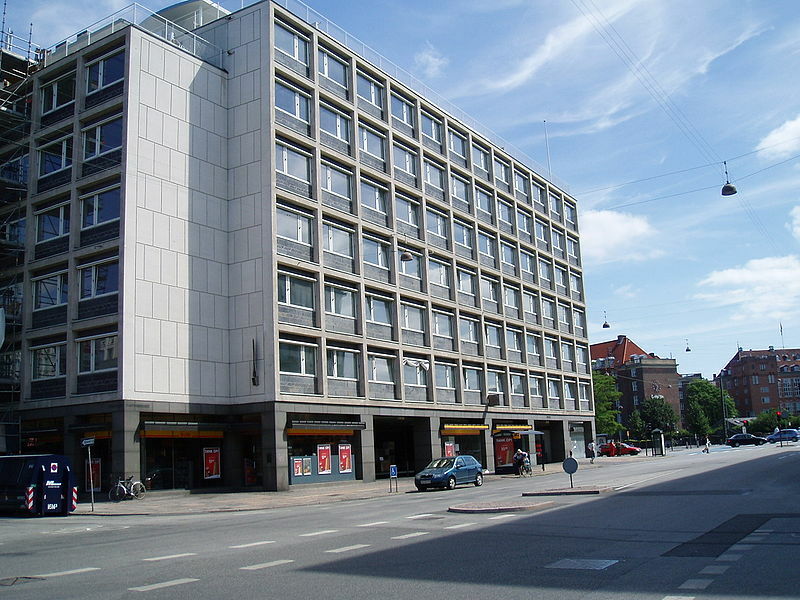 The request to bomb the Shellhus came from the Danish Resistance, despite the fact that it was known that the top floor of the building was being used to house Danish prisoners as a kind of human shield. I have based the following on a post I found elsewhere on the net. You can also read the official RAF account here. By the end of 1944 the Danish resistance movement in Copenhagen was in danger of being wiped out by the Geheime Staatspolizei (Gestapo). Many of their leaders were arrested and a lot of material was filed in the Gestapo archives in the Shell house. Leading members of the resistance-movement requested an attack by air on the Shell House via the Special Operations Executive (SOE) in London. Eventually on 21 March 1945, 20 de Havilland Mosquito fighter-bombers from 2nd TAF escorted by 28 Mustang Mk. III fighters from 11 Group took off from RAF Fersfield in Norfolk, England. 18 of the Mosquito bombers were F.B. Mk. VIs and 2 were Mosquito B. Mk. IVs from the Photo Production Unit (PRU). The Mosquito force attacked in 3 waves: 1st wave with 7 Mosquitoes (one PRU); the 2nd wave with 6 Mosquitoes; and finally the 3rd wave with 7 Mosquitoes (one PRU). The primary objective for the Mustangs was to engage, distract, suppress and if possible destroy anti-aircraft “Flak” batteries concentrated in central Copenhagen. The first wave approached their target from the South West but as they passed Enghave Station, which is near the famous Carlsberg brewery, Mosquito SZ 977, with Pilot W/Cdr. Peter A Kleboe and Navigator F/O K Hall, struck a 30 metre lamppost or pylon; the wingtip of the Mosquito then hit the roof of No 106 Sonder Boulevard. The two 500lb bombs carried by the aircraft ripped off and exploded, killing twelve civilians. Flying at roof-top level over a densely populated area it was inevitable that there would be casualties if a plane crashed or were shot down, but the Fates that day were in an especially cruel mood and worse was to follow. The stricken Mosquito “T for Tommy” crashed seconds later in a garage near the Jeanne d`Arc French Catholic school on Frederiksbergs Allé. The front part with the cockpit with the two crew members landed on Dr. Priemesvej; they were badly burned and later died of their injuries. Pilot W/C Peter A. Kleboe and Navigator F/O Reginald J.W. 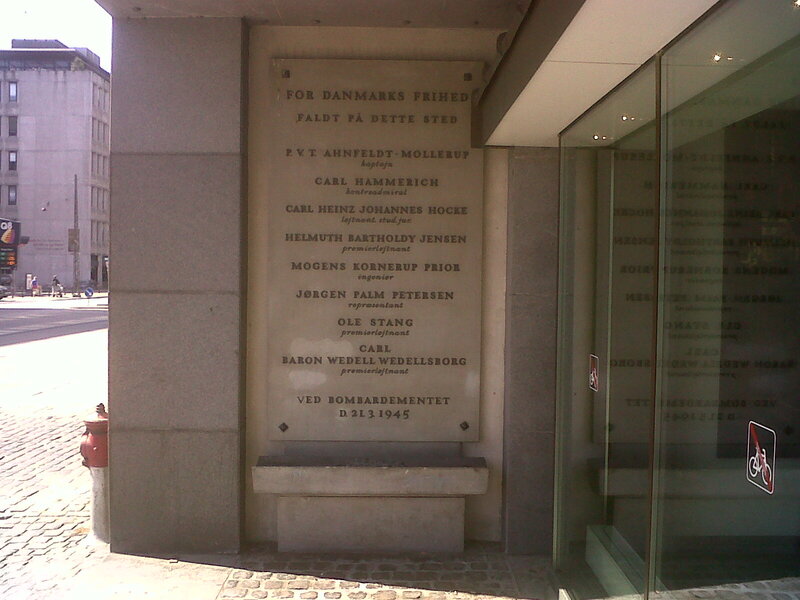 Hall were laid to rest in Bispebjerg Cemetery on 28 March 1945. The rest of the first wave found and bombed the Gestapo Headquarters successfully. In all six bombs exploded in the Western wing and of the nine prisoners in this part of the building, six were killed instantly and another died when jumping from the 5th floor to the ground. But the tragedy that had begun to unfold at Frederiksberg Allé was about to get even darker. The 2nd wave of Mosquitoes became confused by the smoke and flames from the crashed Mosquito and thought it must be their target. Two of the Mosquitoes in the 2nd wave dropped their bombs on the French school and only one proceeded to bomb the Shell House. The 3rd wave approached Copenhagen from the West, and again became confused. All but one of the Mosquitoes dropped their bombs by mistake on the French Jeanne d`Arc Catholic School killing 86 children and 16 adults out of 482 children and adults, while 67 children and 35 adults were wounded. This is the site of the modern Shell House, the original being completely destroyed during Operation Carthage. It’s quite easy to find, on the North side of Kampmannsgade, just to the East of Sankt Jørgens Sø, between Nyropsgade and Vester Farimagsgade. It’s actually quite close to the splendid modern Tycho Brahe Planetarium. You can see here below a map showing the location. Enghave Station is to the South-West, the natural direction from which the incoming planes would have come. The Mosquito “T for Tommy” must have veered North, i.e. to its left, after its collision with the pylon in order to have crashed where it did. Reading about this terrible episode, I was at first surprised that so many pilots misidentified the target, especially since the correct one is so close to Sankt Jørgens Sø, a prominent expanse of water that makes up one of a string of shallow lakes that extend along most of the Western side of Copenhagen’s city centre which one would have thought was easily identifiable by its absence at the French School; the pilots had been shown detailed models of the location before the raid. But then I’m sitting at a desk with a map in front of me, not screaming along at 400mph, over rooftops bristling with anti-aircraft guns, into the teeth of withering Flak fire. I walked the distance from the Jeanne D’arc School to the Shell House and I reckon it’s not much further than 1km, perhaps less as the Mosquito flies. That’s just seconds at the speed the planes would have been flying. That, together with the general confusion of smoke, gunfire and fear, could easily account for the navigational errors. Owing to the presence of planes from the RAF photographic unit, there is remarkable film footage shot during the actual raid, some of which can be seen in the following film. It’s interesting how little Copenhagen’s skyline has changed; much of the city is immediately recognizable. There is also some very moving eye-witness testimony. Even to a non-expert like me this was clearly an extremely dangerous mission. Mr Pedersen told me he saw Mosquitoes flying between the houses, along some of Copenhagen’s admittedly very wide roads, below the level of the rooftops; presumably the anti-aircraft guns were unable to aim downwards. A total of 4 Mosquitoes and 2 Mustangs were lost to flak with 9 crewmen KIA and 1 POW. Incidentally, one of the two Mustangs shot down that day crashed in Fælledparken, the park just behind the Niels Bohr Institute. Mounted on the wall of the present Shell House is a bronze cast of a propeller from one of the downed Mosquitoes. A plaque is placed below the propeller with the names of the 9 crew members who were killed in the attack. A total of 133 Danes died during and after the raid, including 86 children and 18 adults (including many nuns, and some bystanders who had tried to help) at the French School. At the Shell House, 8 Gestapo prisoners were killed and 18 managed to escape; 55 German soldiers and 47 Danish employees of the Gestapo died. In those days they hadn’t invented bland phrases like “collateral damage” to disguise the real horror of war, and it wasn’t possible to use unmanned drones as deployed by the US in their covert “war on terror”. Although Operation Carthage did achieve its objective, the loss of innocent life was so appalling it remains difficult to see it as a success. I remember very well the tears in Mr Pedersen’s eyes when he told me about what had happened at the French School that day; it was only later that he found out what the actual objective of the raid was. At the end he said “You are lucky that you will never have to witness anything like that.” That goes for all of us who have had the good fortune to live in a time of peace. But let’s not forget the other parts of space-time where things are/were very different.